And hello crafty 2014! I hope I will learn as much in 2014 than in 2013. Last year I listed the new skills I had acquired and wished to acquire. Here is this year update. Letterpress printing: I got the loveliest introduction thanks to the workshops organised by the National Print Museum. Block printing fabric: I did some, especially for this pair of curtains, but still hope to do more. I adore the process of craving the lino to make my own stamp. Traditional embroidery stitches: here again I got a lovely introduction by artist Maria Tapper. I just wish I add more time to turn all my ideas into reality! Patchwork and quilting: there will be more of this in my house this year. I took a patchwork course and made my first (sort of) quilt in 2013. But I still have to replace all our dull blankets with proper home made quilts! There are so many techniques to try, this is beyond exciting. Drawing: funnily enough this one should be first on the list because drawing is the thing I need to do when designing a product. Last year I tried some self teaching but I am now at a stage I will need some serious help, maybe a short course over the summer? My obsessions for the new year is woodwork. It is not new and comes back to haunt me now and then. But I came across so many DIY project involving wood lately that I have a feeling learning more about wood and its behaviour will be my next crafty stop. Palette furniture making anyone? 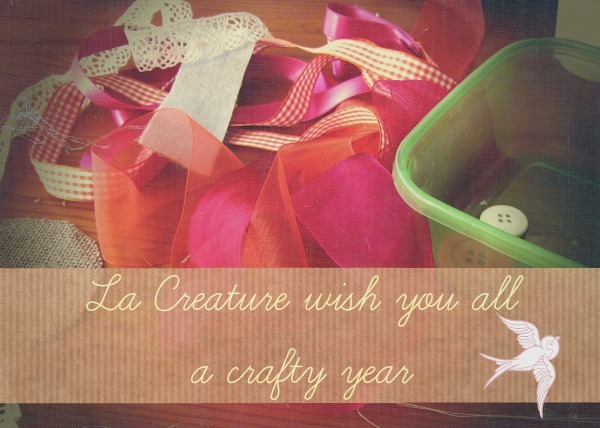 Anyway I wish you all to have a year full of crafts of all kinds and the time to play with your creativity. Next Post Who won the Christmas giveaway? I also Hope for curtains ! !